Click here to read the full review from Paul Pacult. One barrel. Depending upon the unknowns of the Big Horn Basin summer heat, the cold of the Wyoming winter and the appetite of angels, yields about 220 bottles. One barrel. Chosen from a rickhouse of many, for its singular character and taste. One barrel. Bottled to capture this unique bourbon and moment in time, both of which will never happen again. NOSE: browned butter, Cola, black currant and dried dates, orange citrus blossoms, bittersweet dark chocolate, almond butter. PALATE: Cola, dark chocolate, buttered pastry, dried date and fig, raisin and orange citrus. 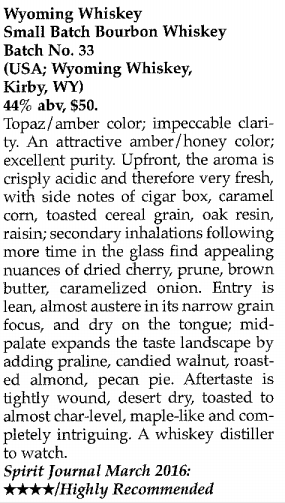 MOUTHFEEL: full and rich, chewy, spicy, creamy with nuts. FINISH: long finish; dry, but with lingering impressions of butter crème, candied orange peel, and dark dried fruit. The most elusive of the WW offering. NOSE: intense, but still buttery-smooth with a nice oakiness, vanilla, Turbinot sugar, orange blossom honey, caramel candy, fudge, and muted touches of clove and nutmeg in the background. PALATE: balance between clove and nutmeg and sweeter notes of fudge, caramel, orange blossom honey, anise, and just a kiss of smokiness that completes the complexity. A straight American whiskey with higher rye content than our Small Batch Bourbon, but short of a true rye whiskey. Different and great. Perfect for sipping or making cocktails. It’s crafted from two distinct mash bills distilled in November of 2011. The first mash bill contains 48% winter rye, 40% corn, and 12% malted barley and the second reflects a traditional bourbon mash bill of 68% corn, 20% winter rye, and 12% malted barley. In keeping with Wyoming Whiskey’s tradition, these grains are all non-GMO and grown in Byron, Wyoming by Rageth Farms. 100 PROOF. BOTTLED IN BOND. Each season, Wyoming Whiskey distiller Sam Mead hand-selects a few special and unique 5-year aged barrels of our Small Batch Bourbon to be part of our Private Stock program. Every barrel is unique. Come raid our private stock.